Karole Marois is a visual artist based in Prince Edward County Ontario. Born in the francophone east side of Ottawa and raised by a working single mother, Karole discovered early in life her passion for the arts as a means of connecting with others. A graduate from the Fine Arts program at the Ontario College of Art and Design, she also holds a diploma from the Academy of Fine Arts in Florence Italy, as well as a Computer Animation diploma from Sheridan College. Karole’s work is essentially figurative. Her large format water based paintings focus primarily on the human figure and nature to address universal themes. 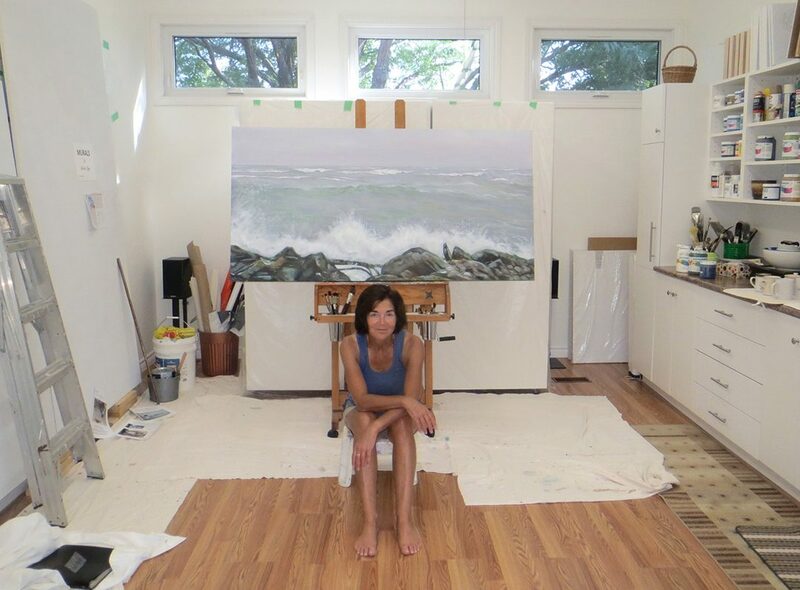 Her interest in painting people in different environments led her to voluntarily participate in the Canadian Forces Artist Program Residency (CFAP) in 2005. She was sent to the Netherlands and given the opportunity to observe up close, the training of the Canadian soldiers during the commemorations of the 60th anniversary of the Liberation of Holland. Her large multi panel painting based on this experience, “The Parade”, has been purchased by the Canadian War Museum for its national collection. An even larger installation of 65 panels, “Together Side by Side” has been acquired by the city of Apeldoorn in the Netherlands, where it remains permanently displayed in the City Hall. Karole’s paintings have been exhibited in galleries and museums across Canada, the US and Europe and can be found in private and public collections. Alongside the creation of her personal artwork, she paints commissions of portraits and murals for the private and public sectors. Her work has been generously supported by private donors, the Ontario Arts Council and the Ontario Ministry of Tourism and Culture. Painting fulfills my need to record thoughts and feelings in an artistic language, while adding a sensuous element that is fundamental in my work. I use local subject matter to explore universal themes such as solitude and togetherness, loss and preservation, conflict and peace. My art is essentially figurative, and I am especially passionate about painting people. The human/nature connection is the focus of my recent series of artworks, and is often visually expressed by merging the figure with the natural surroundings. Drawing and painting, I like to blend intense detail with unfinished areas. I use transparent and fluid acrylics on wood, combining my love of watercolour with working large scale. Since living on the shores of Lake Ontario in Prince Edward County, I am captivated by the people, the land and the water. The protection of this new natural environment is the inspiration for my current body of work. Sylvie-Anne Jeanson nous présente le parcours de Karole Marois dans le premier d’une série de portraits sur les artistes établis dans ce qu’on appelle « La route des Arts » situé dans le comté de Prince Edward. Copyright © 2016-2019 Karole Marois. All Rights Reserved.